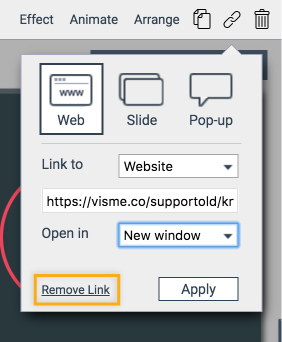 If you have created multiple slides and would like to link one slide to another or directly to a website, you can use the Link Properties to achieve this. First, note that you can set an automatic transition to another slide via the Slide Transitions feature. However if you allow the users to interact with an area on a slide and manually link to another slide, you can then take the following steps. Before you start linking, naming your slides is very important because you can easily make mistake by forgetting which slide is which if you have multiple slides. Therefore, in the right panel, you can rename each slide that best describe the slide. You can apply a link to virtually any element on your slide through the web. Click an object, shapes or icons. If you want the object you selected to be directed to a website, then click the link icon on the top right of the screen. On the Web tab, select link to Website. Next, input the link of the website you wanted the object to be redirected to. If you need to go back and forth between the linked website and the presentation, it is recommended to set this to Open in New Window. Click Apply once you are done. You can preview your presentation and check to see if it will redirect to the website you’ve set. If you Link to Email Address, input the email address you wanted the object to be redirected to. Click Apply once you are done. 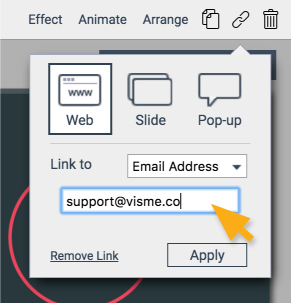 You can preview your presentation and check to see if it will redirect it to the email you’ve set. If you Link to Social Media, choose a type of social media in the dropdown. You can then input Handle for the object to be redirected to. 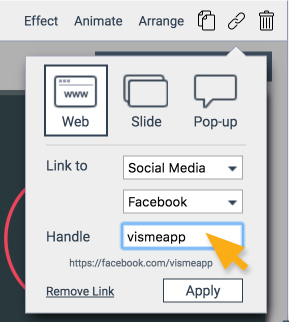 For example, we are linking it to Facebook as Vismeapp. [green_number]3[/green_number][green_number_text]Click Apply once you are done. You can preview your presentation and check to see if it will redirect to the social media you’ve set. To remove any links, Simply click Remove Link.